In the early '90s, drummer Kozo Suganuma formed half of the rhythm section of the legendary Japanese fusion trio Fragile. 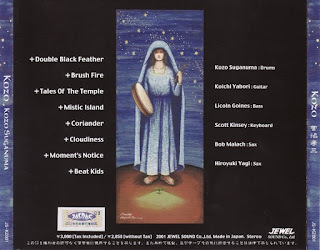 His eponymous solo CD on the Jewel Sound label features eight tracks of modern and traditional fusion, including one Coltrane standard and four tracks written by Fragile guitarist Koichi Yabori. Kozo opens with the snappy fusion jam "Double Black Feather." The pace slows with the drum solo track "Brush Fire," although this exposition is kept tastefully short at under two minutes. The record picks back up with "Tales of the Temple" and the half-time groove of "Mistic Island." After the ballad "Cloudiness" and the Coltrane standard "Moment's Notice," the record closes with the snappy, Caribbean-influenced "Beat Kids." Fragile was often compared to '90s fusion giants Tribal Tech, and that similarity is also prominent in the sound and the songwriting on Kozo. Part of the sonic likeness may be due to Scott Kinsey, Tribal Tech's keyboardist, handling keyboard duties on the record. 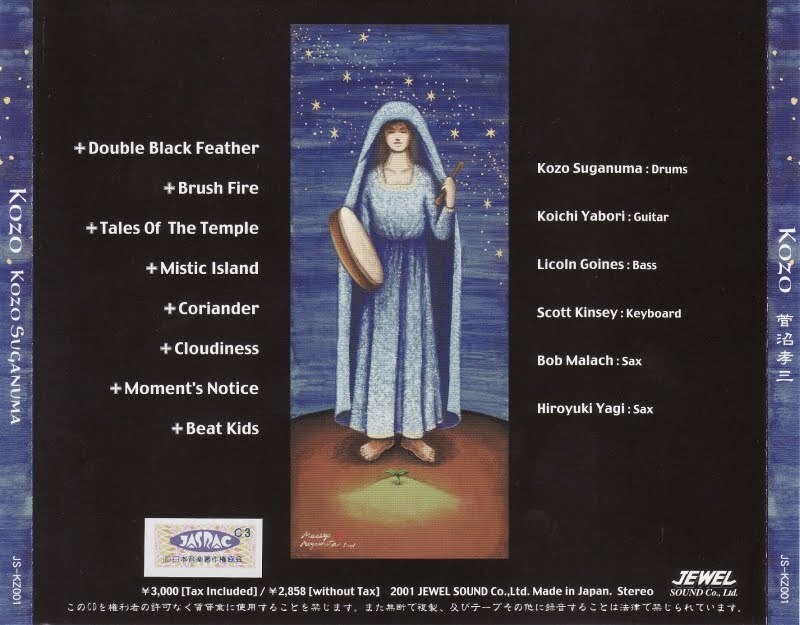 In addition, several of the songs composed by Fragile guitarist Yabori clone the Tribal Tech style of light guitar-based fusion almost exactly. "Tales of the Temple" has the grooving bass guitar melody that characterizes classic Gary Willis tunes. "Coriander" sounds like it's right out of the Tribal Tech live set, and it even includes Yabori playing several Scott Henderson guitar licks note for note. One major sonic element sets Kozo aside from the Tribal Tech guitar-based fusion style—the saxophone work of Bob Malach and Hiroyuki Yagi. The timbre of the sax adds a mellowness and a traditional jazz flavor that gives the music depth, particularly on the ballad "Cloudiness" and the Caribbean jam "Beat Kids." Suganuma was wise to include a saxophonist on the majority of the tracks on his record. The playing by all musicians is excellent. Yabori knows when to lead the band with his skilled guitar work and when to sit back. Bassist Lincoln Goines holds down the bottom, providing snappy lead work on "Tales of the Temple" and "Moment's Notice." Kinsey lays down solid background chording and only steps into the forefront when warranted, as he does with Tribal Tech. Suganuma's drumming occasionally sounds excessively bombastic or heavy-handed, but the one place a little over-reaching play by a drummer can be excused is on his own solo record. A native of Osaka, Japan, Kozo Suganuma, began playing drums at the age of eight and remarkably, became a professional session player at the age of 15. He is now a major feature of the Japanese pop scene performing with such groups as Chage and Aska, as well as also working with famous Japanese Jazz icons Hidehiko Matumoto, Makoto Ozone, and Kazumi Watanabe. 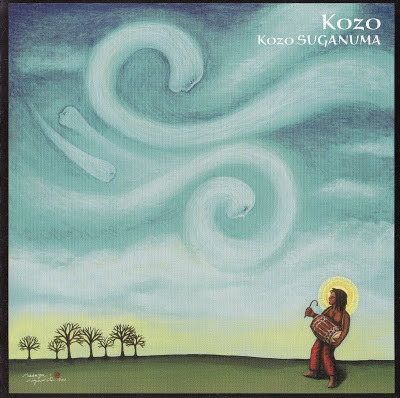 Kozo has also worked with American artists such as Larry Graham and Louis Johnson. Kozo is an extremely active player and can be found performing in small jazz venues one day and 20,000 seat auditoriums the next. He is also an in-demand session player as well, having released 6 albums with his band "Fragile." Because of his amazing technique, Kozo has been given the name "The King of Many Strokes." This title has been incorporated in several teaching videos: TE KAZ OH ("The King of Many Strokes"); ASHI KAZ OH ("The King of Many Footworks"); Kaettekita TE KAZ OH ("Return of the King of Many Strokes"); and TE KAZ OH Live Jissenhen ("Live Applications of Many Strokes"), released by Rittor Music. A very much in demand clinician, he has been featured in many National and International percussion events.